Correctly known as the “Four Regions Floating Market”, the sub-sections of this 100,000sqm development represent the four major areas of Thailand – the north, northeast, central and south. This representation comes in the form of shops and stalls selling souvenirs, fruits, food, art, handicrafts, postcards and clothing as well as regular cultural shows and demonstrations. Some of the 114 vendors do indeed float, selling their wares from traditional boats and canoes. The rest are built into a sturdy stilted village, with covered walkways and stout bridges connecting them. Khao Pattaya View Point on Pratumnak Hill is the best viewpoint in the region and the place to visit day or night to get that classic shot of Pattaya’s sweeping, crescent bay. Be warned though, this is anything but an insider’s tip so expect to share your view with an almost ceaseless conveyor-belt of package tours and the local traders who follow them touting cheap souvenirs and expensive refreshments. This might sound off-putting but the reality is tours will usually stop for 10 to 15 minutes and once they have been called back to the bus, the view point becomes quiet and peaceful – perfect for enjoying the stunning scenery. If told to imagine a cerulean blue sea and a long stretch of pristine beach void of high-rise buildings and away from the claws of civilization, Pattaya would probably be the last place to conjure up in your mind’s eye. Well, that would be the case until you’ve discovered Koh Larn (Larn Island), a little piece of paradise beyond the hustle and bustle of Pattaya… Also known as Coral Island, Koh Larn – situated 7.5 kilometres west of Pattaya Beach – has long been an alternative retreat for those who have become jaded with Pattaya’s overdeveloped and overcrowded beaches. Since the island is not so far away, visitors can easily go there in the morning, stay for a couple of hours and then come back to Pattaya Beach late afternoon. And the most convenient way of doing this is by taking a guided tour – complete with hotel. Ripley’s Believe It or Not! 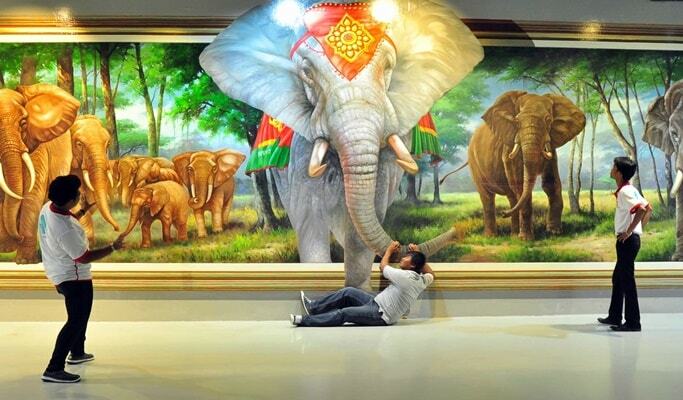 contains over 300 exhibits which will boggle the mind. Telling only true stories and facts, the surprising and shocking displays prove that the truth really is stranger than fiction. Alongside this museum of the marvellous are several fun rides, a waxworks museum, a 12D Moving Theatre and the extremely popular Sky Rider – the yellow and white balloon which can be seen rising above Pattaya Beach, offering unique views of the city and the surrounding area. The largest engraving of Buddha in the world, the gold-embossed image was carved out of the side of a limestone mountain with a laser and is 130 metres in height and 70 metres across at its widest. The area in which it resides – commonly known as “Silverlake” – is one of remarkable natural beauty, with a couple of other nearby attractions. Pattaya is home to a choice of outstanding water parks, including the largest in all of Thailand, with dozens of slides and rides between them. The biggest and best, including Ramayana Water Park and Cartoon Network Amazone Waterpark, are located just about 20 minutes away from Pattaya City. Each park has on-site restaurants and a range of helpful facilities for families. 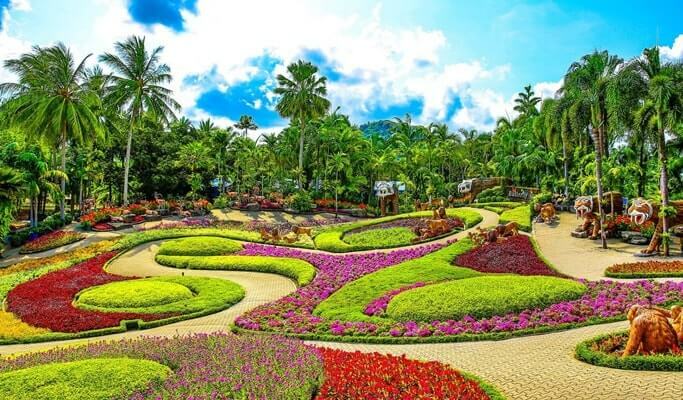 The 2.4sq.kms of Nong Nooch are full to bursting with some of the most remarkable flowers, displays and landscaped gardens in Thailand, if not the world. The team behind them have repeatedly won international awards for their designs, which include 17th-century-French-style gardens, a recreation of Stonehenge, creative topiary displays and gardens created exclusively with cacti, bonsais and tropical palms. It is also the home of over 670 native and hybrid species of orchid and regular displays of classic Thai dancing, boxing and drumming. Ko Samet is one of the eastern seaboard islands of Thailand. It is in the Gulf of Thailand off the coastline of the Thai province of Rayong, approximately 220 kilometres (140 mi) southeast of Bangkok. Ko Samet is part of the Phe Subdistrict of the Amphoe Mueang Rayong, of Rayong Province. Ko Samet is the largest and westernmost of a cluster of islands not far from the coast. Ko Samet measures 6.8 kilometres (4.2 mi) from north to south. At its closest point to the mainland, the island is 2.6 kilometres (1.6 mi) south of mainland Rayong Province; however the actual travelling distance from the main commercial tourist pier in the town of Phe to the island’s closest tourist beach is about 10 kilometres (6.2 mi). Our Chonburi Zipline course is located in Chonburi province on the borders of Chompoo Wildlife Reserve. The convenient location is approximately 1 to 1.5 hours from Bangkok or Pattaya. 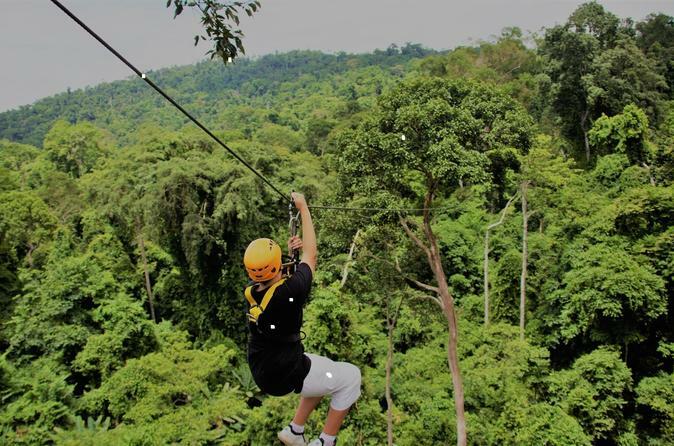 Round trip transfers are included when you book a Ziplining tour with Flight of the Gibbon. Experience a 2-day adventure from the metropolitan city of Bangkok to the sandy beaches of Pattaya. Enjoy the beautiful scenery of paddy fields, canals, and rivers as you pedal your way to Woodlands Resort for the night. Dine on your well-deserved meals between your bike rides to keep you going.